A disturbed student shoots up his classroom -- and suddenly a wave of mass murder is sweeping through our nation's schools. A young child is taken from her home -- and for months afterward child abductions are frantically reported on an almost daily basis. A surfer is attacked by a shark -- and the public spends an entire summer fearing an onslaught of the deadly underwater predators. Why do the terrible events we see in the media always seem to lead to more of the same? Noted author and cultural behaviorist Loren Coleman explores how the media's over-saturated coverage of murders, suicides, and deadly tragedies makes an impact on our society. This is The Copycat Effect -- the phenomenon through which violent events spawn violence of the same type. 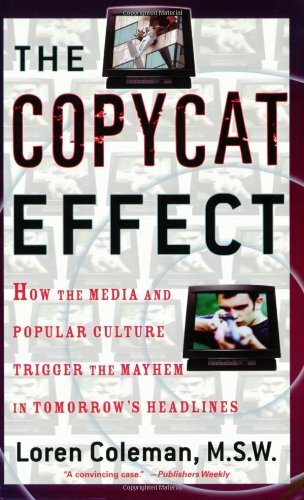 From recognizing the emerging patterns of the Copycat Effect, to how we can deal with and counteract its consequences as individuals and as a culture, Loren Coleman has uncovered a tragic flaw of the information age -- a flaw which must be corrected before the next ripples of violence spread.